"Mr. Badanes provides great service at a very reasonable price." "You are the best. I will recommend you to all." Attorney Advertising Notice: Under New York's Code of Professional Responsibility, portions of this Web site contain attorney advertising. Prior results do not guarantee a similar outcome. This Web site is for informational purposes only and is not legal advice. Information contained within is not intended to create, and receipt of it does not constitute an attorney-client relationship. Internet subscribers and users and online readers should not act upon any information presented within without seeking an attorney's advice. We understand your intellectual property (patents, trademarks, copyrights) rights are important to you. We also understand that you are concerned about the costs of protecting these rights. Our fees are typically much less than other intellectual property attorneys, yet, you get the benefit of our years of experience in this field. In the Badanes Law Office, the client’s needs come first and we listen to your concerns and address them head-on. You want an attorney that is attentive, responsive, diligent, intelligent, and talks to you in plain English. We pride ourselves in exceeding these goals. Trademarks, copyrights, and patents are intellectual property rights that are often misunderstood. We help you understand and protect your intellectual property rights. We have extensive experience in patent litigation law, trademark law, copyright law and trade secret law. We always offer free consultations and in most cases we can discuss your legal issues over the telephone. This will save you time and money. We can also meet you in the evening, at your business or home, or in one of our satellite offices. Please note that we use independent patent attorneys and patent agents to complete the patent application as the Badanes Law Office does not directly file patent applications. We serve clients in Northport, East Northport, Huntington, Centerport, Greenlawn, Commack, Dix Hills, Elwood, Fort Salonga, Kings Park, Melville, South Huntington, Huntington Station, Nesconset, Smithtown, Babylon, Islip, Centereach, Cold Spring Harbor, Deer Park, Farmingville, Hauppauge, Holbrook, Holtsville, Islandia, Port Jefferson, Riverhead, Stony Brook, Selden, Southold, Cutchogue, Bellmore, Bethpage, East Meadow, Farmingdale, Garden City, Hicksville, Levittown, Massapequa, Mineola, Plainview, Syosset, Wantagh, Westbury, Suffolk County, Nassau County, or anywhere in Long Island from Montauk to Great Neck and all the towns in-between, contact the Badanes Law Office. If you need a Patent Litigation, Trademark, Copyright Attorney to help you call the Badanes Law Office. 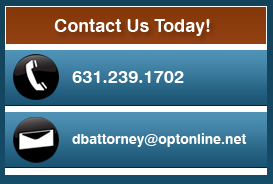 If you are looking for assistance from a Long Island divorce lawyer, visit dbnylaw.com.